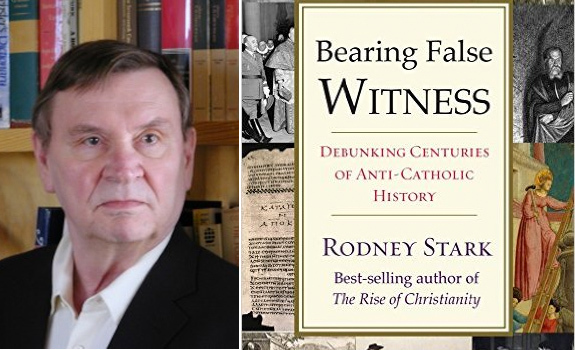 For a change, RW turns to historical trends in religion, namely the phenomenon of anti-Catholicism as documented by Baylor ISR’s co-director Rodney Stark in his new book Bearing False Witness (Templeton Press, $19.57). The book covers topics ranging from myths about Catholic origins and the “lost” Gospels to Catholicism’s attitudes concerning slavery, science, and capitalism. We briefly interviewed Stark about his book in early December. RW: There have been other books on anti-Catholicism, but Catholics have usually written them; as a non-Catholic, what interested you enough about this subject to write a book on it? Stark: I kept running into these dreadful lies, and they not only prompt anti-Catholicism, they badly distort history. I became concerned that so many of them are taken for granted by educated people. RW: The book sets out to debunk stereotypes and other popular myths about Catholicism throughout history, such as about the church’s role in the Inquisition and the Crusades. What myth did you uncover that was the most surprising to you during your research? Stark: Until I was faced with overwhelming data, it was inconceivable to me that the Inquisition was other than a dreadful, murderous institution. That it was, in fact, a force for moderation was inconceivable to me. But, the fact that the witch-hunts that swept through the rest of Europe were prevented in Italy and Spain by the Inquisition is undeniable. And that was only one of its good deeds. RW: The role of the church in World War II and its complicity or at least passivity in the face of persecution of Jewish people has been the subject of several popular books, but you argue that the church was unfairly attacked on this front; can you explain that? Stark: The overwhelming testimony by major Jewish figures is that the church opposed Hitler and managed to save a lot of Italian Jews. The lie about Hitler’s pope began in Moscow.